Following the less-than-favourable response to the recently-unveiled poster of Once Upon a Time in Hollywood poster featuring Leonardo DiCaprio and Brad Pitt, the makers of Quentin Tarantino's ninth movie have launched an uber-cool website for the film, that reveals the opening scene from Tarantino's script. There is one catch though — the script is revealed only as one types on their keyboard, as if a modern version of Tom Riddle's diary that divulges information only when the inquisitor pens them down. Keeping in tandem with the colour palette of the film, the page is sepia-toned. The paper, half-peeking out of the typewriter machine, features the instructions just before what appears to be the exposition scene. To capture the essence of 1961, the scene needs to be filmed using a 16 mm lens in B/W, the instruction reads. Leonardo Di Caprio plays Rick Dalton, the famous star of the western TV show, Bounty Law. The directive says that it's a scene where a TV reporter has come on the sets of Bounty Law to interview Rick Dalton and his stunt double Cliff Booth (played by Brad Pitt). Although dressed in same attire, Booth has had to wear the signature pompadour 'Rick wig' to resemble Rick, the script reads. Tarantino's ninth film is about the “golden age of Hollywood” — which focuses on Charles Manson and his followers’ murder of actress-and-model Sharon Tate (Margot Robbie). In addition to A-Listers Pitt, DiCaprio and Robbie, Once Upon a Time in Hollywood also stars Al Pacino, Emile Hirsch, Damian Lewis, Bruce Dern, Dakota Fanning, Scoot McNairy, Luke Perry, Lena Dunham, Tim Roth, Michael Madsen, Kurt Russell, Timothy Olyphant, and James Marsden. 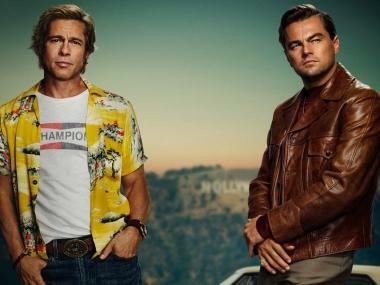 Once Upon A Time in Hollywood is expected to have its world premiere at Cannes 2019 and will hit theatres on 26 July later this year.